It's a 192 page story that follows the life of Bree Tanner, a newborn vamp that is introduced on page 569 of Eclipse, and ten pages later she dies. (No wonder it's a novella.) First printing will be 1.5 million. Not surprising, but Wow! According to Meyer, it is an "exercise" she did when she was writing Eclipse to help her understand what was going on in the novel. 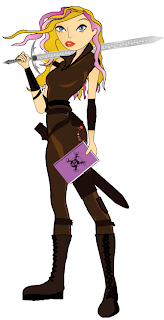 Bree is part of the newborn army of vamps that the revenge hungry Victoria creates to help her hunt and kill the Cullens and Bella. 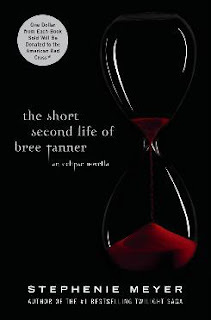 The story covers the last week of Bree's 'newborn' life just before the big fight between the vamp army and the Cullens, and at that point she has been a vampire for about 3 months. The character will be seen in the upcoming Eclipse movie (June 30) and will be played by Canadian actress Jodelle Ferland. The cover looks good. I like the 'time running out' concept in the hourglass with the red sand trickling through. Clever! While it's not Midnight Sun, perhaps this will help satisfy some of the ravenous appetite for all things Twilight! While I'm thrilled to read anything by Stephenie Meyer, I am itching for something new from her. I know its going to be free online for a bit, but I have to buy it for my pretty shelf!! I was surprisingly not that affected by this. I'd really like to read something new by her, or even a sequel to The Host. And of course releasing Midnight Sun would totally make my day. -sigh- But it's all wishing at this point. Umm according to Goodreads.com there is going to be a sequel to The Host. I saw it on a poll for the most anstipated book of 2010. Good just be rumor though. Anyways. I think this novella will be kind of neat to read. Give more of an insight to Jasper since he was a newborn like Bree for a while. Not a huge Twilight fan,but this sounds nice.. I'm excited for the novella. But seeing the actress portraying Bree for the first time she doesn't really fit my expectation. I know she's a short lived character but thats not at all how I pictured her. I'm not sure how I feel about this novella. There are so many characters that SMeyer could have explored a bit more and I just don't feel like Bree was the one she should have started with. I'll most likely buy this just so I get a little more insight into the series, but I can't say that I'm desperately awaiting it. Do you think Midnight Sun will be publish?? I'm not sure about this one at first because I'm not really a fan of short stories. Though, I think I'll end up reading in the end because everybody will be talking about this and I cannot stand the itch any longer. So yeah, we'll see how this one goes! ?